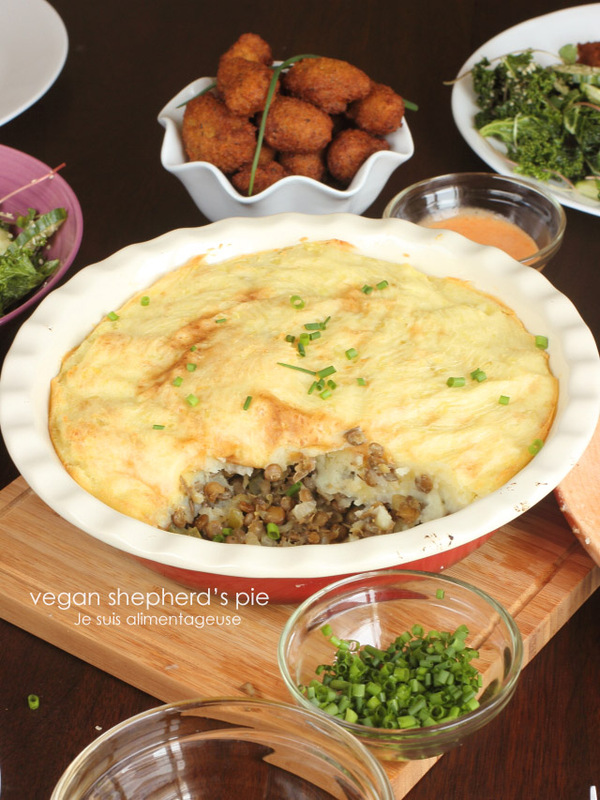 Vegan Shepherd’s Pie is a veganized take on a classic comfort food. WTF it’s June?! How did this happen? I feel like it was just the other day I was pathetically trying to warm up my hands as I waited for the bus at school. I was bundled in scarves, sweaters, mittens, boots. And now… I’m wearing flip flops, flowing maxi dresses, sweating uncomfortably, avoiding the oven and struggling to not chop off my hair because it’s so damn long. Excuse me if that’s not something everyone can sympathize with. I’m finally able to enjoy having flowing long hair but it’s being stupid and getting stuck under my purse strap or car doors. I don’t want to cut it because frankly there’s something about long hair that makes me feel pretty. Letting my hair fall down as I undo a bun or sweeping it to the side out of nervousness because there’s someone ridiculously attractive standing in front of me makes me feel less like an awkward tool and gives off the illusion that I could be some sort of pretty graceful person. Of course, that’s when the bus door closes and traps my hair or I struggle to turn my head because my hair is stuck in my armpits. Let’s just say I’m thankful thatÂ I’ve got Chris because I’d be utterly useless in the dating world. My friends keep talking about Tinder and OKCupid and the struggles they deal with as they’re trying to find someone who isn’t a total d-bag or super creepy. What is a date anymore? I’d be totally lost.Â All the small talk, Facebook creeping, Twitter lurking, Instagram snooping, Hot-Or-Not type apps. I don’t know how people are coping now. FAR TOO MUCH STIMULATION FOR HUMAN INTERACTION. Maybe that’s why I’m so happy that Chris has almost zero presence online. The only place where I could manage to have a non-awkward date is if I cooked for ’em. Hi, nice to meet you, let me stuff your face full of food. Oh and by the way it’s vegan. 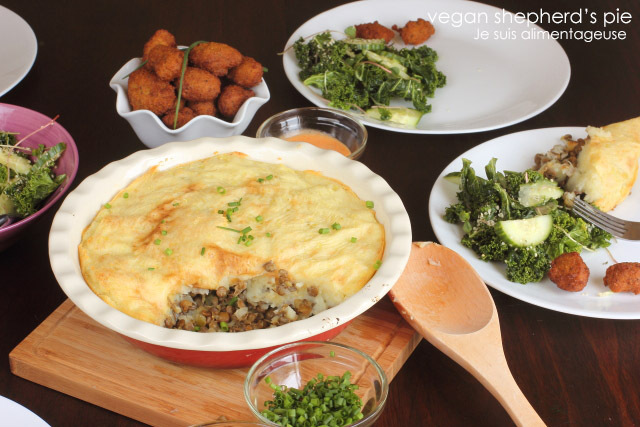 Take this for example: fluffy mashed potatoes spread on top of savoury and tender green lentils. If you want to go an extra step and douse this in vegan gravy, but I was too lazy for that. I just drown it in sriracha sauce and we’re good to go. Oh you want some small talk? Here are some lentil fritters and I’ll chew on that while I think of something charming to say. Combine the green lentils, water/broth, bay leaves, olive oil, pepper, molasses, oregano and thyme in a pot over medium heat. Once at a boil, lower down to a steady simmer and cover, cooking for at least 30 minutes until lentils are tender. Once tender, remove from heat and add garlic salt, salt, and nutritional yeast. Meanwhile, in a large pan over medium heat, sautÃ© onion in olive oil until translucent. Add green peppers and continue to cook until they're soft and are a bright green. Add to lentils and stir to combine. Set aside. Cover quartered and rinsed potatoes with water (about an inch) in a large pot. Add salt and bring to a boil, then lower to a simmer to cook potatoes until just fork-tender. Strain, run under cold water to rinse away starch (or else you may have a gluey consistency). Transfer back to pot and mash with butter and almond milk. In a large pie pan, add lentil layer, and cover with mashed potato layer, sealing any edges to keep the lentils from drying out in the oven. Bake, uncovered, for about 20 minutes, then switch to a broil until the edges are golden brown and the top has patches of golden colour. 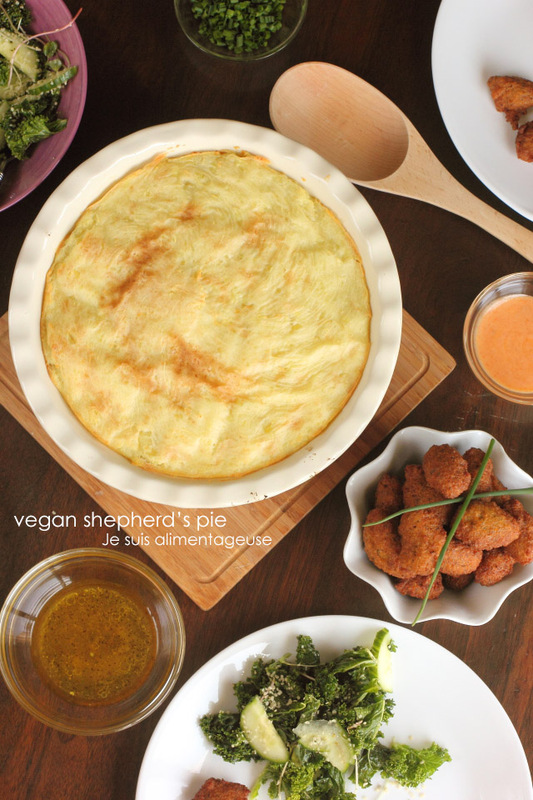 Yes, yes and more yes to this entire pie! !